A few years ago I had a colleague who was staunchly opposed to the growing trend of including high-impact visuals in the online content he produced. His argument ran something like, “I’m a writer. My job is to grab my readers by the throat and convince them of the value of my content, using only my words.” To this guy, images were a distraction at best, and an example of pandering to the lowest common denominator at worst. Just because people like bright and shiny things didn’t mean we should cave—in fact, it was our responsibility as content providers to stand firm against the onslaught of the catchy visual! Needless to say, I couldn’t disagree more. Humans are naturally drawn to images, and connect to them more readily than to print or audio alone. We process images quickly, and understand their meaning clearly; they reach us on an unconscious level, and can evoke intense feelings at a glance. Pictures can be used to tell a story, sometimes without using any words at all. When a high-impact visual is used to introduce text, it can act as a silent advertisement, telegraphing the meaning of the words and drawing an audience to that amazing content you worked so hard to write. I do agree with my image-hating friend on one thing: as online content providers, great content is the core service we offer. Thus, even the best visual should have one goal: to complement, highlight, and draw attention to the words and ideas we’re presenting. In the vast ocean of words that forms the internet, high-impact visuals attract attention. Since the advent of Facebook in 2007, social media has taken off like a rocket—and as it has grown, the length of social media posts has continued to shrink. From Twitter’s 140-character limit to 99% visual sites like Pinterest and Instagram, we’re finding ourselves with lots to say, and very little space to say it in. Images have become a key way of communicating with few (or no) words. Think about it: when you’re scrolling through your Facebook timeline, don’t the posts with compelling images grab your attention first? Not only that, but high-impact visuals just beg to be shared—a prospect that can cause yer average content marketer to quiver with joy. When I pointed this out to Captain No-Images, I tried not to smirk. Let’s face it: I’m no designer. For quite a while, I relied on stock photos and Wikimedia Commons to fill my need for visual content. Lately, though, I’ve begun experimenting with creating images to complement the text I produce. Sites like PicMonkey and Canva allow me to put together slick, professional-looking visuals without spending a fortune. I’m especially fond of Canva, both for its ease of use and its affordability—most of the elements I use are free, and when I choose a “premium” element, I pay $1 to use it. So far I’ve created over 100 graphics using Canva, and I’ve paid a grand total of $4. Plus, Canva offers great mini-tutorials on topics like fonts, balance, special effects, color, and so on. I’ll never put any real designers out of business, but I do like knowing that I can whip up a decent design without breaking a sweat. 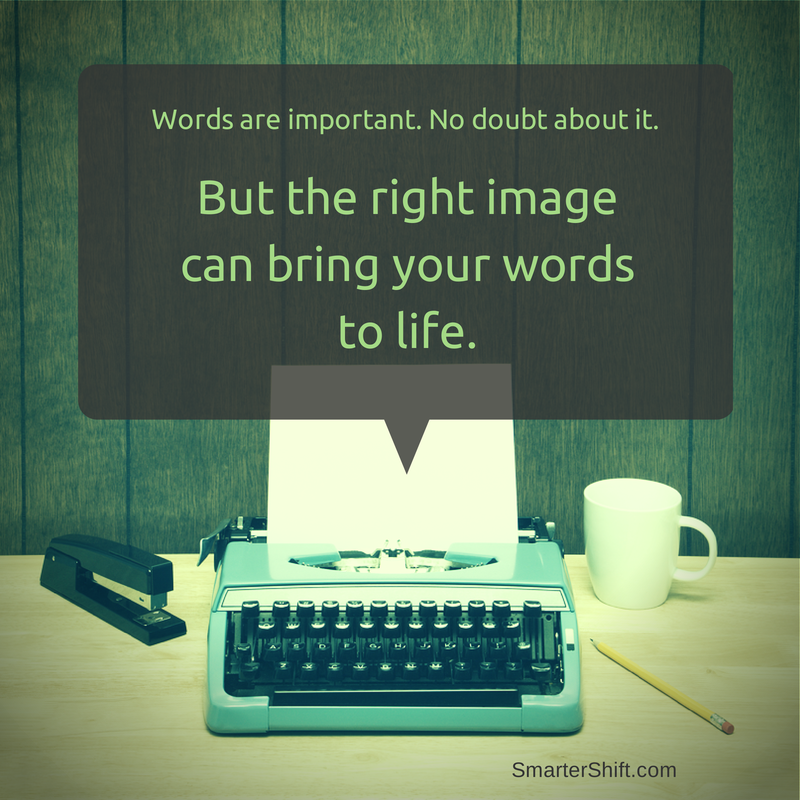 Do you routinely include high-impact visuals in your content? How does it affect the number of shares, clicks, and favorites your social media posts receive? Do you create your own, or rely on image banks or a designer? We’d love to hear from you!